Abraham obeyed God. Abraham woke up early the next day. Afterwards Abraham prepared the wood for the burnt offering. Then he saddled his donkey with Isaac along with two young men to Moriah. After three days of journey, Abraham saw the place within a distance. 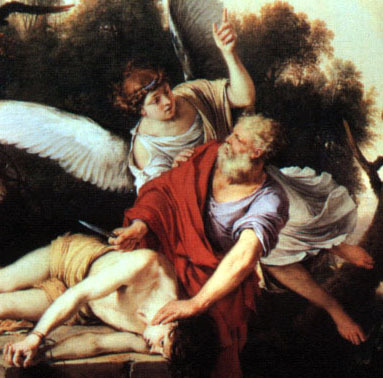 As Abraham was about to kill Isaac, an angel of the Lord stopped him. Right after the angel finished speaking; Abraham saw a ram caught in the bush. Abraham killed the ram and offered it as a sacrifice for the Lord. Later, Abraham and Isaac went back to his men and they returned to Beersheba.